If you own art which has seen better days, you might want to find someone who knows how to restore it. 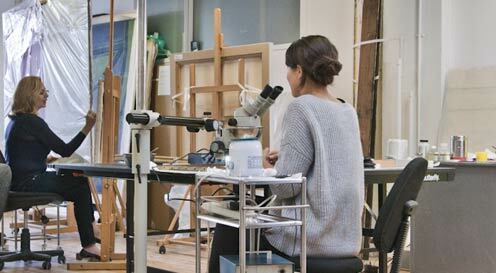 One example is Julia Nagle Conservation Ltd who restores easel art. Recently, we visited their London studio and were impressed by all the academic rigour and practical experience that goes into being restoration specialists. Yet, everyone there appears genuinely modest about their work. Before you know it, you are being introduced to Afghan crystals, chemistry and varnish secreted by insects. That is just the beginning. You soon notice the many pickled and jarred things from all over the world. They are lining the walls of a work space which cannot decide whether it wants to be a workshop, library or laboratory. In this exotic place, you immediately sense that the work is marinated in 20+ years of expertise. Collectively, the staff masters four centuries worth of art methods and materials, and the track record speaks for itself. Julia, the owner has assisted the Tate and the Serpentine Galleries in the UK. In addition, she has worked with international clients such as the National Gallery of Australia. The development of the restoration services has been evolutionary, and at times also revolutionary. After having restored much renaissance work in brown, it was time to take on contemporary art as well. As an example, Nagle has restored the works of Banksy. The artist’s work is clearly a restoration challenge, and a welcome one at that. Impoverished artists use inferior-quality art supplies, and for collectors it matters greatly the day the artist becomes more collectible. An experienced restorer is able to provide you with a thorough condition report and recommend the best way forward. In this process, your expectations are being managed carefully, and a restorer makes sure you fully understand before commencing further work. What and how to restore? There are many professional judgement calls in restoration work. Sometimes they are ethical dilemmas that must be addressed. Here you can rest asured that all sensitive issues are dealt with in strictest confidence. Take for instance the perennial problem of repentimenti. It is an Italian word that ought to mean ‘lots of surprises’. Instead, it means ‘repentance’. See in the lifetime of a painting, previous work may have been covered either by the originator, or – more likely – other artists. Subjecting the art to Infra-red light would pretty much reveal everything that has ever happened to it. This is the moment when you realise that your art might have changed dramatically over time. The more radical the change, the harder it can be to decide what to restore. E.g what do you do when the painting suddenly shows more than one signature? At a much more practical level, many restoration decisions centre around paint once the work of art has been cleaned up. As oil paint ages, it has a tendency to turn slightly transparent. In addition, colour pigments fade when subjected to the UV of sunlight. It raises all sorts of questions. E.g. should you match the vibrancy of the paint when it was newly applied by the originator, or blend the paint in with the old and faded. One thing that makes it much easier to decide is the notion of ‘reversibility’. E.g. Varnish is applied to the damaged area so as to make any restoration on top removable with solvents. Everything that leaves the Julia Nagle studio is restored in a reversible way, and made from the most authentic and lasting materials. The studio also opts for the least intrusive restoration methods avialable. Consider here, the specialist skill of stitching up tears and abrasions on canvases. It consumes much time to do all this manual work with needle. However, it is not as radical as re-lining a canvas, which in turn has been a common practice for years. The latter has caused many problems such as crushed impasto when carried out without due care and attention.